I’m proud to be different. I tick many diversity boxes on a diversity form, it’s what makes me unique. My eyes have been opened to intersectionality by the theme of the Same But Different project created by Business in the Community to celebrate all women in the workplace, whether LGBT women, older women, women with disabilities or anything that makes us unique. The truth is that we are all women, but there is a great diversity within gender. The theme for the International Women’s Day is to #BeBoldForChange and I believe that everyone had a part to play to close the gender gap, which is currently predicted to close in 2186. This means that I won’t ever see it close, neither will the next generation. But the changes we make to speed this up need to consider all women. As a bisexual woman, do I join the Women’s Network or the LGBT network? I believe in equality, so do I join the Black, Asian and Minority Ethnic network and the Mental Health Network? The answer is yes! Women have multiple identities and that should be praised. When developing initiatives and being bold for change, we need to make sure we reach all women. Not forgetting diversity in its broadest sense too. For example, your socio-economic background, your accent or your personality and learning style. I’m proud to chair the Environment Agency’s Women’s Network which started in 2010 and has over 2200 women and men. A few years ago we asked about multiple identities. Some women were going through menopause; some wanted to progress up the ranks, some didn’t; some women had children, some didn’t; some women care for relatives; some identify as non-binary; some are just starting their career; and some are introverts. We have diversity within gender. 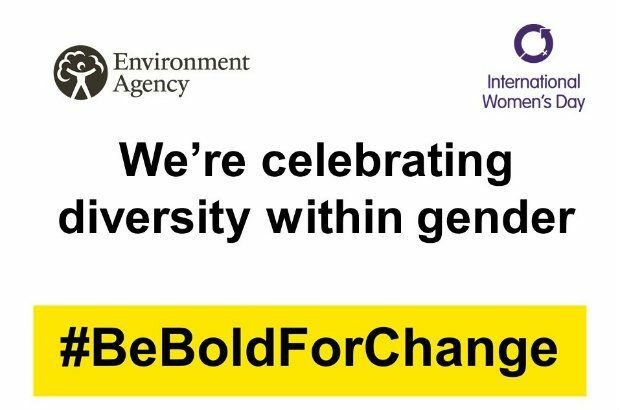 This year on International Women’s Day the Environment Agency will host two of the Cross Government events, welcoming colleagues from Departments and Agencies to our events in Bristol and Exeter. We will follow the Civil Service theme #BrilliantlyDiverse and have a series of speakers and workshops discussing diversity. Going back to the question about what diversity network I should join . . . I’m in all of them. I believe in equality and if I’m not linked to the network by what makes me unique, I join every network as a supporter of equality. Great post. And thank you for pointing out your mental health network!